No Fees. No Commissions. Put More Cash In Your Pocket Quickly. You’ll Get A Fair Cash Offer – You Choose The Closing Date. Easy, Quick Sale! We Buy Houses Wake County NC! We Buy Houses In Wake County NC In Any Condition – In Any Price Range. Check Out How Our Process Works. We’re Ready To Give You A Fair Cash Offer For Your House In Wake County, North Carolina. If you’re saying “I need to sell my house fast Wake County NC”, then we would like to make an all cash offer to purchase your house and close on a date that works for you. We buy houses in Wake County and anywhere near Raleigh, NC. Contact us today! Avoiding foreclosure? Facing divorce? Moving? Upside down, behind on payments on your mortgage? Liens need to be paid off? It doesn’t matter whether you live in it, you’re renting it out, it’s vacant, or not even habitable. We help owners who have inherited an unwanted property, own a vacant house, are behind on payments, owe liens, downsized and can’t sell… even if the house needs repairs that you can’t pay for… and yes, even if the house is fire damaged or has bad rental tenants. Sell Your House Fast in Wake County NC – Need Help? Even if an agent can’t sell your house, we can help. (Sometimes selling a house through a real estate agent is not for everyone.) That’s where we come in. We buy houses Wake County NC. A house we bought and renovated in Wake County NC. We can buy your house. Contact us today! These things help the selling process be less stressful, easier and faster. We can close in as little as 2 weeks. We can quickly decide on an offer for the house you are selling, and if you accept our offer… we’re ready to buy right now! We want to help you sell that house that is putting a burden on you and your family… while treating you fairly and paying you a quick, fair, and honest price for your home. 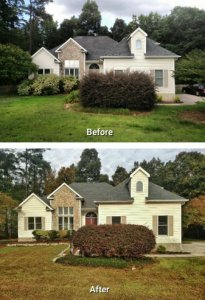 Are you too busy or don’t have enough money to fix up all of the repairs needed to prepare your house to sell fast in Wake County? We help homeowners just like you who face all sorts of situations, such as probate, inherited a property you want to sell for cash, bad tenants in a rental property, job loss, relocating to another state, divorce, or even facing foreclosure. No matter the situation or what kind of property you want sold, contact us today! We buy houses Wake County NC. Will Selling Cost You Money in Wake County?